Twenty years ago Angie and I landed in Rangoon for a few weeks backpacking overland through Burma. We recall a tough environment with little excess. Traffic was non-existent and roads often unpaved. Our 14-hour bus ride to Bagan turned into 17 hours with the breakdown at 3am factored in. The train from Mandalay back to Rangoon loosened many of the fillings in our mouths. As seasoned travelers we had met our match. Burma 2, Burns 1. Arriving into Burma by cruise ship arguably is already a step up from how we last landed in the country. The road from the port to Rangoon gave us our first new glimpse of the country with traffic starting even before reaching Rangoon. Cars and trucks outnumbered the scooters and bicycles. 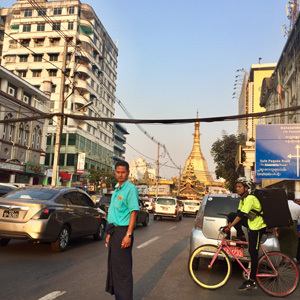 In Rangoon where roads are narrow and often clogged with pedestrians, food cart vendors, open sewers and lugubrious dogs we could see that much had changed yet most had stayed the same. Modern renovations to old buildings sprinkled the city. Major hotel brands dotted the skyline. New trendy restaurants filled the streets with wonderful smells. A renewal of sorts was underway. 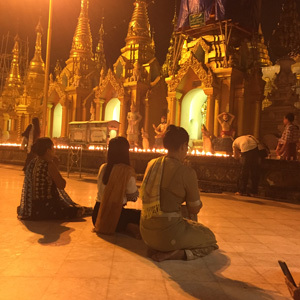 Shwedagon Pagoda is the heart chakra of the city. Even while under renovation the complex is packed with prayerful pilgrims and immaculately dressed families. Small to large monks march in file between stupas while oil lamps flicker in the slight yet welcomed breeze. There is a festive atmosphere here while couples with trendy hairstyles walk hand in hand and children scamper about on the smooth tile floor. The streets and markets are filled with life as well. A sparkling new Rosewood hotel stands juxtaposed to dilapidated old buildings once built by the British. Numerous vendors selling food and clothing crowd the back streets. A few beggars and monks ask for alms but the atmosphere is light and gentle. 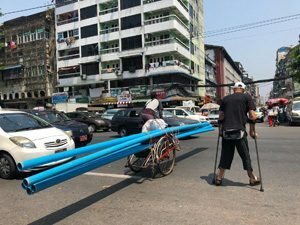 Dogs don’t bark at strangers even when they are crossing the road while walking with crutches while shadowing a batch of 10foot water pipes being transported on a bicycle. Burma is a young country where what look like high school graduates already have one or more children. But it is also an old country with a dynamic history. One hundred years ago in was the Singapore of Asia with impressive credentials and statistics. An international superstar in a region at the dawn of development. But the intervening years and rulers have not been kind to the country and it now lags behind as one of the world’s least developed nations. A regrettable situation but one sadly understandable when people in power do little for the people they rule. Sailing away from Burma we feel optimistic that what goes down must come up. After decades of abuse and challenges the people of Burma deserve the pendulum to swing back in favor of a modern progressive nation. The energy on tap shall surly help to bring this land into the modern age as a zephyr of change flows over Burma. admin Gregory Burns is an internationally recognized fine artist and world-class athlete. He set four world records in swimming during three Paralympic Games. After 30 years of painting, across 60 nations, he has received critical acclaim in a dozen countries and the 2016 Sports Artist of the Year Award.